With the help of our partners, CBN is building family and community wells that provide clean, reliable water in needy regions of the developing world. Our staff work with local leaders to identify needs and coordinate each project. In most places, bore wells and protected hand-dug wells are most effective and can meet the needs of several hundred villagers. At least 1.8 billion people are using contaminated drinking water every day1. An estimated 801,000 younger than 5 years of age perish from diarrhea each year. The majority of these illnesses (88%) are the results of poor sanitation and unsafe drinking water1. Improved water supply can boost a country's economic growth and can contribute greatly to poverty reduction1. 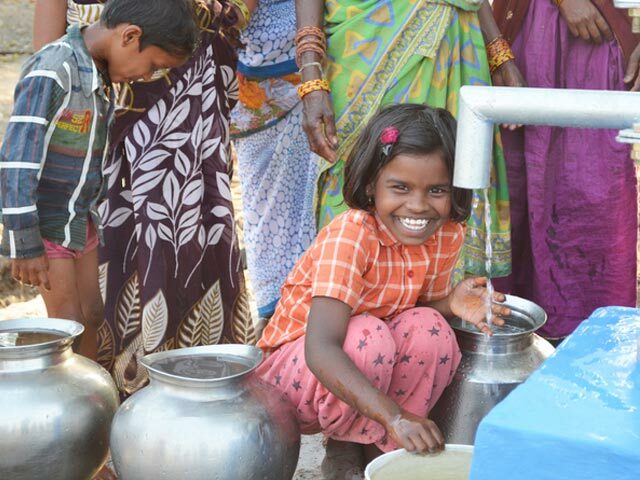 CBN provides access to life-sustaining water through clean water wells. Each well project addresses hygiene and sanitation concerns considered significant by agencies like the World Health Organization, to ensure a safe water supply. As a result, many people testify about the differences that clean water makes in their lives, families, and communities. As a CBN partner you can have the confidence of knowing your gift does so many things. Whether providing life-giving water, feeding the hungry, healing the sick, or broadcasting the Gospel, each gift changes lives here in America and around the world.